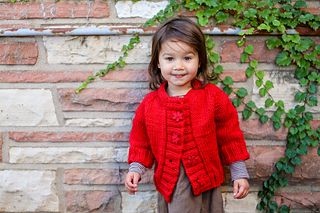 Companion sweater for your little one is great to wear it for the cold days. Constructed from top-down seamlessly. Features ¾ sleeves. Knit Picks Wool of the Andes Superwash Bulky weight, 100 grm, 137 yds, 2 (3, 3) hanks, #26518 Red or color of your choice. Circular Needle 20” or longer, US Size 10 (6.00 mm), or size needed to obtain gauge. Notions: Darning needle,Stitch Markers, waste yarn, and buttons of your choice. The sweater shown used four, but you can use more if desired.